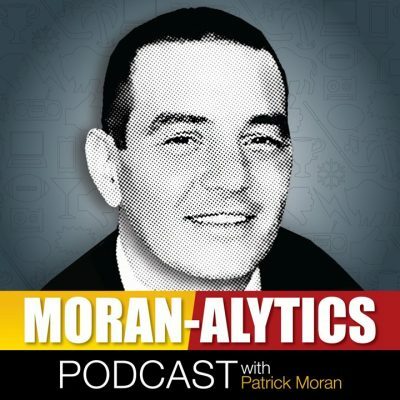 On this episode of the Moran-Alytics Podcast, Patrick Moran chats with WROC-TV Rochester sports reporter/anchor Dan Fetes on a variety of topics. Fetes talks about being born and raised in Webster, New York and growing up a fan of the Buffalo Sabres and Atlanta Braves. He liked playing sports as a child while also learning young that it was fun to “play” sports reporter. It’s a path that led him to SUNY Fredonia for college; giving him both an opportunity to play baseball and learn about the sports journalism profession. Fetes talks about how going to a small school had its advantages and ultimately helped hone his craft. Fetes also reveals his biggest influences in the sports media, describes his favorite and least favorite parts about his profession, offers his take on social media, gives Sabres fans insight on some of Rochester’s top prospects and goes through the Mini-Lightning Round, where we learn of his fondness for Genny Light, The Replacements, Pat McAfee and Chipper Jones among others. You can follow Dan Fetes on Twitter @DanFetes and check out his WROC-TV work by clicking here. Moran also has a segment with Aaron Quinn (@AaronQuinn716) from Cover 1. The two spend time talking about the Senior Bowl from last week, with Quinn analyzing a handful of prospects he thinks could be good fits for the Buffalo Bills. He also discusses how the pair of University at Buffalo prospects, Tyree Jackson and Anthony Johnson fared at the Senior Bowl and explains what the Cover 1 (http://www.cover1.net) “Lofton Exercise” means. Quinn also takes part in the Moran-Alytics Interest Meter, offering scores and takes on a handful of sports and pop culture topics. Sandwiched between the interviews is Moran’s offering on WWE’s Royal Rumble from Sunday night.